Studies attest that strength training, as well as aerobic exercise, can help you manage and sometimes prevent conditions as varied as heart disease, diabetes, arthritis, and osteoporosis. It can also protect vitality, make everyday tasks more manageable, and help you maintain a healthy weight. 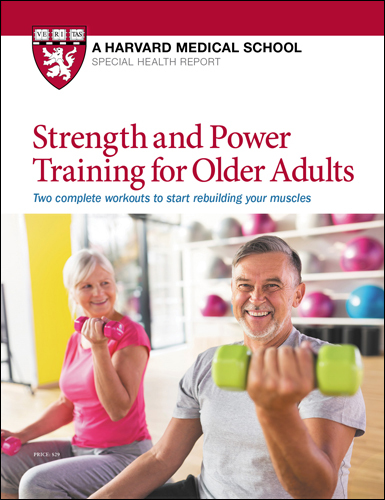 Strength and Power Training for Older Adults answers your strength training questions and helps you develop a program that's right for you. When it comes to exercise, strength training rarely gets the attention it deserves. The fact is strength training is equally important to aerobics. Its often overshadowed by aerobic exercise, the kind that makes your heart beat faster and your lungs work harder. The cardiovascular benefits of aerobic exercise can add years to your life — strength training can make those years fuller and more rewarding. Strength and Power Training for Older Adults, a Special Health Report from Harvard Medical School, will introduce you to workouts that you can easily fit into your schedule. With just two sessions per week, you’ll fortify your muscles and bones, add tone to your body, and confidence to your life. These are exercises you can tailor to your fitness and goals. The workouts are designed to motivate you and help you build upon your success. The report provides complete workouts for strength and power as well as for stretching and balancing. You’ll find 25 instructively-illustrated exercises. Plus you’ll get tips for avoiding injuries, charting your progress, buying gear, keeping sessions fun, and much more! So get moving! Order this Special Health Report now! Prepared by the editors of Harvard Health Publishing in consultation with Jonathan Bean, M.D., M.S., M.P.H., Assistant Professor, Department of Physical Medicine and Rehabilitation, Harvard Medical School, and Medical Director, Spaulding Cambridge Outpatient Center, and Walter Frontera, M.D., Ph.D., Dean, Professor of Physical Medicine and Rehabilitation and Professor of Physiology, University of Puerto Rico School of Medicine, and Lecturer, Harvard Medical School. 2015. No matter how many birthdays come and go, muscles perform the same type of action. But as muscle mass in the body shrinks with the passing years, strength also declines. Sarcopenia—the gradual decrease in muscle tissue—starts at around age 30. The average 30-year-old can expect to lose about 25% of muscle mass and strength by age 70 and another 25% by age 90. Some of these changes stem from the physiological effects of aging, but disuse plays a bigger role than many people suspect. Studies of older adults consistently prove that a good deal of the decline in strength can be recouped with strength training. Likewise, power can be regained. With age and disuse, the nerve-signaling system that recruits muscle fibers for tasks deteriorates. Fast-twitch fibers, which provide bursts of power, are lost at a greater rate than slow-twitch fibers. You might think of a nerve pathway as a set of paving stones leading to a destination. As the years pass, the path may become overgrown and disappear in spots rather than remain well traveled and clearly marked. Preliminary power training studies suggest that movements designed to restore neural pathways can reverse this effect. Having smaller, weaker muscles doesn’t just change the way people look or move. Muscle loss affects the body in many ways. Strong muscles pluck oxygen and nutrients from the blood much more efficiently than weak ones. That means any activity requires less effort from the heart and therefore puts less strain on it. Strong muscles are also better at sopping up sugar in the blood and helping the body stay sensitive to insulin (which helps cells extract sugar from the blood). In these ways, strong muscles can help keep blood sugar levels in check—which in turn helps prevent or control type 2 diabetes. Strong muscles enhance weight control, too. On the other hand, weak muscles hasten the loss of independence, as everyday activities—such as walking, cleaning, shopping, and even dressing—become more difficult. They also make it harder to balance your body properly when moving or even standing still, or to catch yourself if you trip. The loss of power compounds this. Perhaps it’s not so surprising that, by age 65, more than one in three people has suffered a fall. Because bones also weaken over time, one out of every 20 of these falls causes a fracture, usually of the hip, wrist, or leg. Some of these fractures can lead to serious or even fatal complications, but in general, people with greater muscle strength before a fall are less likely to sustain a serious injury.